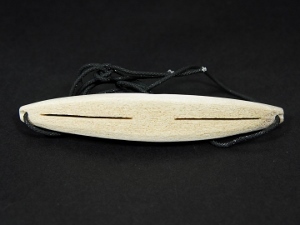 We have a small collection of authentic Canadian Inuit snow goggles made from antler or horn. They come with a natural leather strap or nylon cord. See our gallery on NaturalExotics.com for available snow goggles. As of October 2017, our assorted Inuit snow goggles are all made from caribou antler with nylon straps. Each one is different so call or email us for pictures. Genus and species of caribou: C. Rangifer tarandus. Wild. Caribou in Canada are only protected in wild populations from southeastern British Columbia.